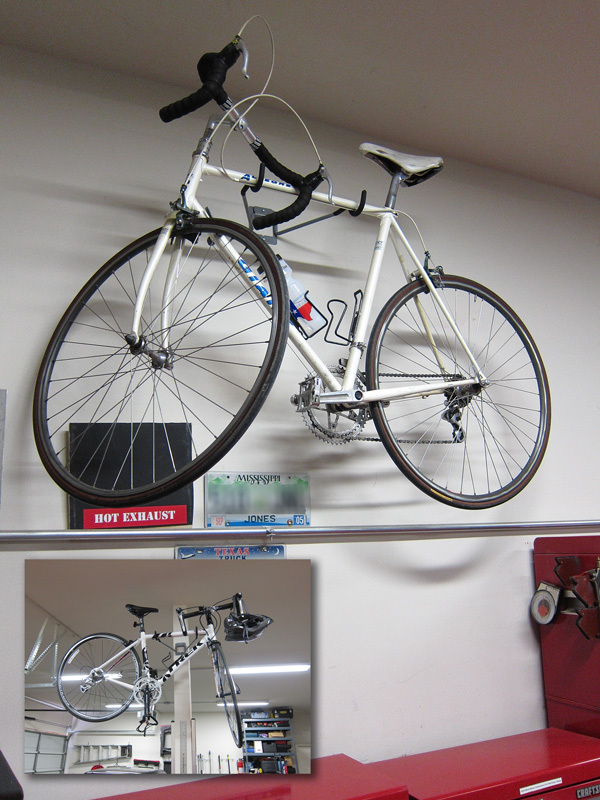 Currently viewing the category: "Storage"
Questionmonger: Best Way to Hang a Bike? A while back I got into cycling a bit, and I now have two bikes kicking around the garage. When it’s hot as hell (like now) or freezing, storing them is simple: I just installed a couple of hooks and hung ’em up and out of the way. But when it gets more temperate, I’d like to have easier access to them. Essentially, I don’t want to have to drag out a ladder in order to get them down. How do you deal with this at home? It’s kinda like the Chevy vs. Ford of tool storage: some folks like pegboard and some don’t. But if you happen to be a fan, you’ve probably stared up at your perfectly-arranged pegboarded wrenches and thought, “Why can’t I hang up my router and drill, too?” Answer: Because while you might be able to convince your drill to stay on the board (mostly) with a couple of well-placed single hangers, it’ll always be rickety. And there’s no way single hangers will hold your router. So forget cobbled-together single hangers and try these custom-made hangers instead. They’re designed to cradle your various tools — routers, ail guns, circ saws, recip saws, drills, and so on — and they’re perfectly spaced to fit into standard pegboard, slatboard, and metal grid storage systems. Pricing runs around $10-$12 per hanger. And admittedly the website seems a bit simplistic. But hey — it’s like $10-$12, right? Might be worth a shot. 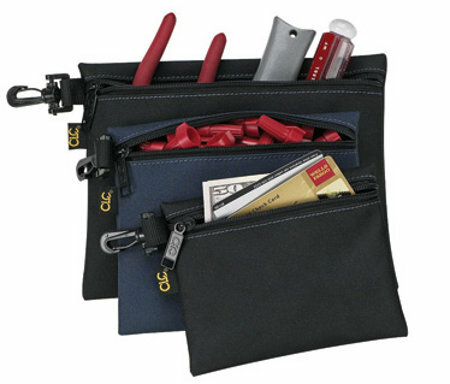 Custom LeatherCraft, known for their aprons and tool holders, has come up with a way to store some of those odd parts and tools that would otherwise end up buried in the bottom of your tool apron — stuff them into one of their clip-on zipper bags and hang it from your belt. It looks like these bags are made from the same 600D polyester which their non-leather aprons and tool holders are made. 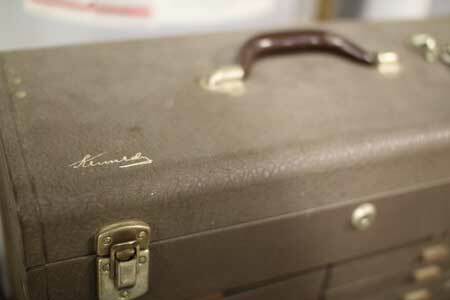 They sell them in a three pack with a 9″ by 7″ bag, a 7″ by 6″ bag, and a 6″ by 5″ bag. Pricing starts around $7 for the set. With a new truck parked outside the shop, I took the opportunity to reorganize my vehicle’s toolkit. As I shuffled things about, I found I needed different types of storage for the truck, so I began repacking with newfound efficiency. 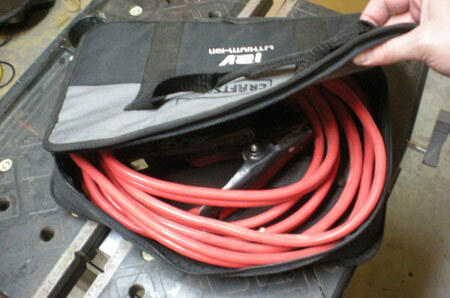 What you are looking at here (above) is the most useful thing the Craftsman Li-Ion bag has done since we destroyed all the tools that went in it a while back. 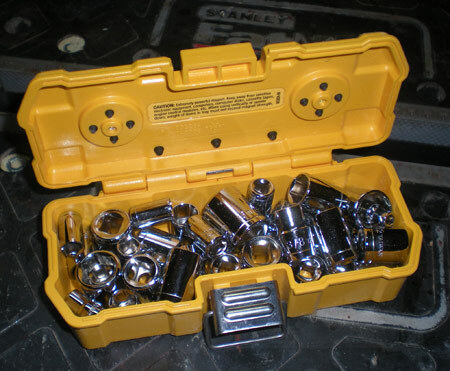 Another repurposed item was this sweet DeWalt magnetic storage box, which I found will hold an entire 40-piece socket set and still clip shut with no issue. Is Your Router Feeling Cold? The temperatures are dropping and you’ve started getting out the winter clothes, but did you ever think about your poor router feeling the chill? 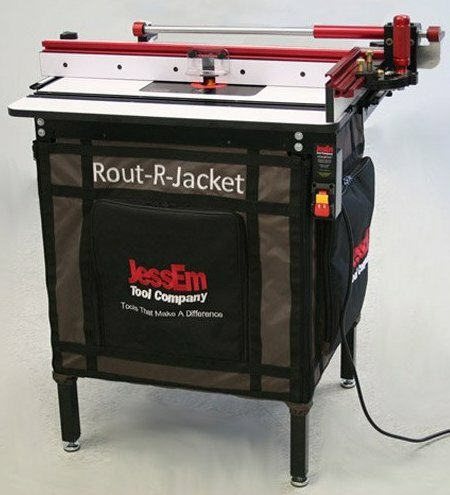 JessEm has your router covered with their Rout-R-Jacket… oh wait, it’s not that kind of jacket? Let’s try this again. Unless you have a fully enclosed router table, collecting all the dust you produce can be hard. About a year ago we covered the Dust Bucket, a sheet metal box that encloses your router to catch the dust. JessEm’s Rout-R-Jacket is a similar type of enclosure, except it’s made out of fabric. 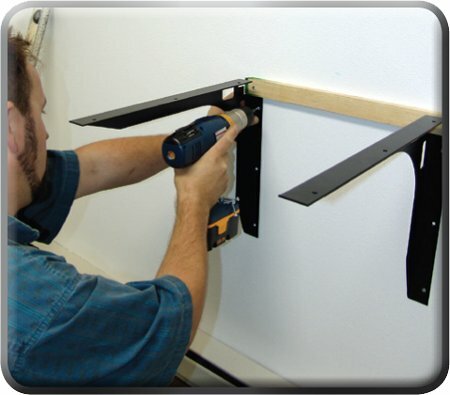 There are tons of different shelf support systems on the market, but not every system works well in every situation. 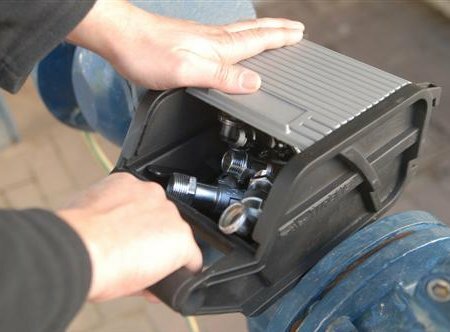 FastCap’s Speed Brace has features that may make it a better choice when it comes to certain tasks. The first and most notable feature is an alignment notch that FastCap claims makes aligning many supports easy. Just install a straight cleat level on the wall and the Speed Brace’s 1-1/2″ by 1-1/2″ notch slips over the cleat, making aligning each brace almost foolproof. I wonder if using a cleat to align other types of shelf brackets wouldn’t work equally as well, but then what do I know? 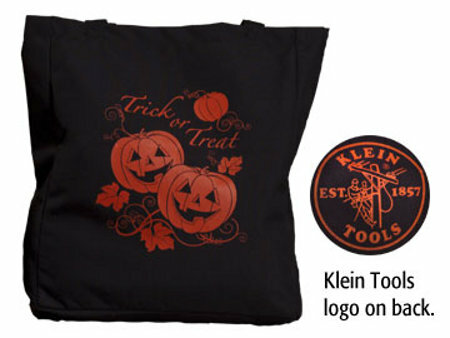 Now Klein Tool fans can show their love for all that is Klein by making their kids use Klein’s Halloween tote bag when they go trick-or-treating. The 4″ deep by 15.5″ wide by 14.5″ tall bag provides about half a cubic foot of space to stash your hard-earned candy. They stamp a “Trick or Treat” design on the front of the bag and a bright orange Klein Tools logo on the back so everybody knows where your loyalties lie. Klein only offers the bag for a limited time; if you want one you need to order it before October 27th. The tote bag will run you $7 plus what appears to be a flat shipping rate of $7; I tried putting up to 20 bags in the cart and it was still $7 to ship.